The ice is where it’s at! This year has been quite the year for speed on the ice for me. I have raced nearly the entire season at Georgetown and now I have had the chance to run up at Bridgestone Winter Driving School as well! Georgetown is a pretty amazing thing to have nearby. The Our Gang Ice Racers provide very affordable racing very nearby. Heading up there takes an hour and the racing usually lasts all day. For only $20 on the race days and $5 on the fun days, well it is pretty tough to find any racing that comes close to that type of affordability. We’ve been having a lot of fun getting to know the crew up there as well, attending meetings and just basically hanging out with the guys and gals that run the racing up there. What a great group! I’ve had a great time getting to know them, racing with them and working with them on new ideas. With Jon’s suggestions they have started making some longer tracks which everyone seems to be enjoying. So now we have half to 3/4 mile tracks to run rather than 1/4 mile tracks, combos of sweeper corners and tight hairpins and man they are fun! Check out a video from the last race of the year. 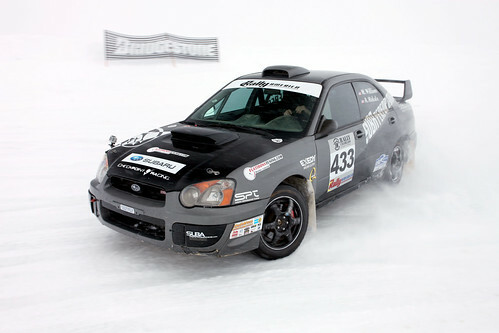 Since I know some people in the racing world I happen to know some instructors at the Bridgestone winter driving school. Since I attended the school back in 2007, I was invited up there by Dave Kern. We headed up with two sets of studs, one car and a closing day at the track. Bridgestone is a pretty cool place. They create the same ice tracks each year with the help of Gordon Speck, their track manager. It is all laid out by GPS and it is an amazing site when seen from the air. Unfortunately I don’t have access to that video to share with you, but hopefully I can dig something up for you in the future. In the mean time check out www.winterdrive.com for their information. Bridgestone teaches winter driving skills to students that are novices up to advanced drivers. They do their entire school on bare rubber with Bridgestone’s Blizzak tires. They also do truck and trailer driving classes which are pretty incredible to see as well. 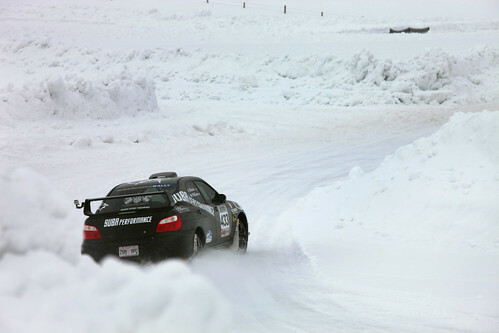 We were fortunate to be able to try out the studded tires on the track. From what I understand this is either the first or one of the very few times a studded tire has ever been run there. I can tell you that it was an incredible experience! 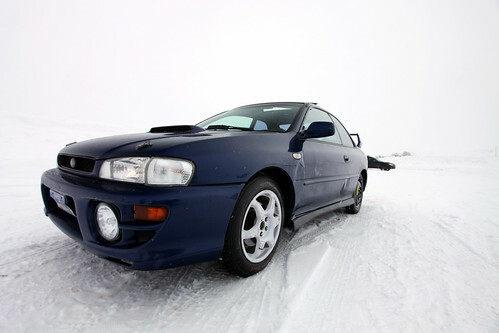 We bolted up the tires on my car and we bolted up Jon’s set on Mitch Williams rally car. WOW what an awesome time. The studs hooked up like crazy, the track has big walls of snow which provide a bit of intimidation, but man, when you nail a corner it is just an incredible feeling. The studs scuffed up the track a bit and combined with the temperatures make the Blizzak’s hook up even better. HERO GRIP! So I bolted my studs onto another car to let others have fun with them then ran my Blizzak’s and had a blast as well! In addition to driving the track it was incredible to be able to ride with some awesome drivers. 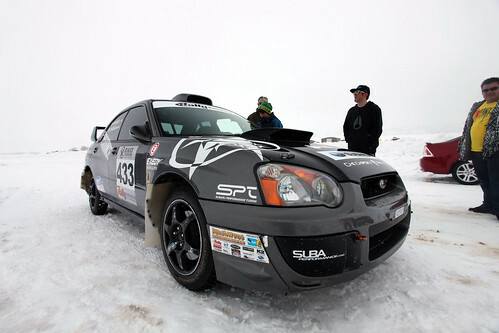 Dave Kern took me for a spin in the Rally car and what an awesome experience. We hit 90+mph on the ice and the confidence and control that these guys have is amazing. 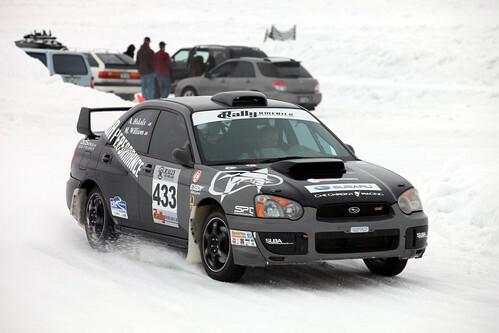 Matthew Johnson was out in the rally car as well and it was amazing to see him tearing up the track. I am sure you are wondering, where is the video from Bridgestone… well look no further! Click play and enjoy. Keep your eyes peeled for some rally cross videos this summer.